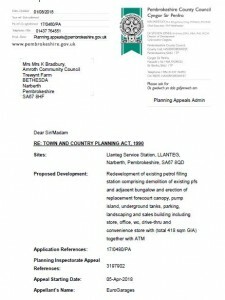 Please find attached information regarding an planning appeal hearing for Llanteg Service Station. It is taking place on Tuesday 21st August at Llanteg Village Hall, starting at 10 am and it is anticipated will last all day. 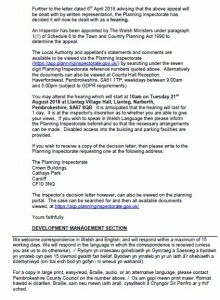 Note; There is no automatic right to speak at the hearing – it is at the Planning Inspectors discretion as to whether residents may give their views.